Description: Manufacturer Part Number: A46-00 842-18114 FJ285 16600-10Y00，1660010Y00 Interchange Part Number: 842-18114 1660053J00 1660096E01 16600-96E00 Other Part Number: FJ285: 16600-53J03 16600-53J00，1660053J03 Product name: Fuel Injector Car compatibility: For Nissan 300ZX Jecs 3.0L 2.4l V6 A46-00 Pin: 2 pin Fitment: 1993-1999 Nissan Altima 2.4L L4 1992-1999 Nissan Maxima 3.0L V6 1991-1999 Nissan Sentra 2.0L L4 1995-1998 Nissan 200SX 2.0L L4 1991-1998 Nissan 240SX 2.4L L4 1993-1996 Nissan 300ZX 3.0L V6 1991-1993 Nissan NX 2.0L L4 1997-2001 Infiniti Q45 4.1L V8 1996-1997 Infiniti J30 3.0L V6 1991-1999 Infiniti G20 2.0L L4 Package Included: 6 x Fuel Flow Injector. These were pulled from a running Z32 with a 555cc tune. One missing pintle cap. Might get lucky and get a full set for what 2 used ones go for! They all ohm out correctly. Good used condition. Worked fine when pulled. Two 90-93 OEM Nissan 300ZX Old Style NA 270cc Fuel Injectors - Used - w. Caps. Condition is Used. 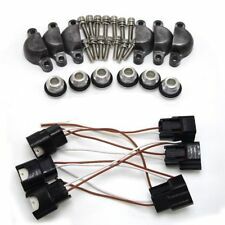 Also including 4 injector caps as pictured. Pulled out of a running NA 300zx years ago and have been sitting in a sealed bag. Nissan 240SX Altima 300ZX Q45 Fuel Injector Set 6 OEM. They may also fit other years and models. 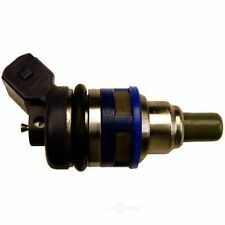 Set 6 Turbo fuel injector fit 1990-1994 Nissan 300ZX 3.0L V6 VG30DE VG30DETT z32. 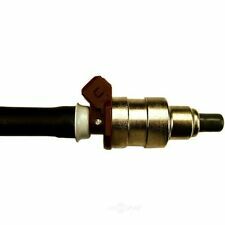 270cc Turbo fuel injector fit 1990-1994 Nissan 300ZX 3.0L V6 VG30DE VG30DETT z32. - 1990-1994 Nissan 300ZX 3.0L Turbo. 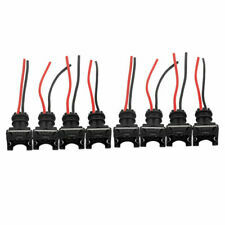 This Set of 6 Jecs fuel injectors will fit on Various Nissan and Infiniti Vehicles. 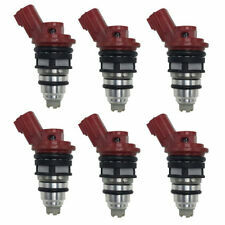 Warranty is issued with every set of remanufactured fuel injectors. This warranty is non-transferable. The first step is to notify us of your specific issue. 90-94 NISSAN 300ZX SET OF 2 USED TWIN TURBO NISMO FUEL INJECTORS 555CC PULLED OUT OF 1991 NISSAN 300ZX TWIN TURBO. BOTH INJECTORS OHM OUT WITHIN SPECS. THESE WILL FIT ONLY 90-94 TWIN TURBO MODELS. If unsatisfied with the. Application: Nissan 300ZX 1994-1996. CarPartsCorner is NOT a Nissan or Infiniti dealer. 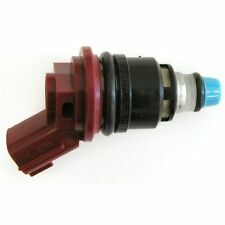 DeatschWerks Injectors: All Deatschwerks high flow fuel injectors are built using only quality OEM cores. In addition, each set is balanced to within a 2% flow variation. All injectors are backed with a comprehensive 12-month warranty. Not sure if it fits Turbo or not! 90-94 NISSAN 300ZX SET OF TWIN TURBO FUEL INJECTORS RAIL PULLED OUT OF 1991 NISSAN 300ZX TWIN TURBO. RAIL IS FOR SQUARE PLUG INJECTORS 90-94 TT OR 90-92 NON TURBO. If unsatisfied with the. 1984-1989 Nissan 300zx Z31 with VG30ET, VG30DE and VG30E engine. Up for grabs is Clean Injection 300zx z31 fuel upgrade. The injector are Dynamically and statically flow tested and balanced to ensure cylinder per cylinder horsepower equilibrium. 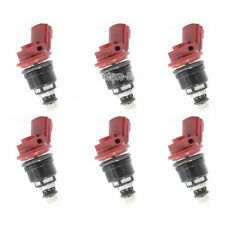 Set of 6 270cc side feed injectors for Nissan 300zx 90-96. Note: The DeatschWerks P1-P2 Sidefeed Injector Adapter Kit is required to install these injectors in the 90-94 Nissan 300zx only. All DeatschWerks injectors feature the following. 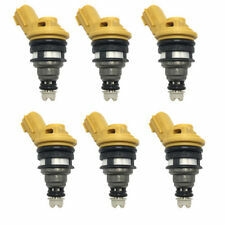 Warranty is issued with every set of remanufactured fuel injectors. This warranty is non-transferable. The first step is to notify us of your specific issue. Re-assembled with new OEM high quality components (seals, filters etc.). Off a 1990 Nissan 300zx Non Turbo. NISSAN 300ZX 3.0L Naturally Aspirated 1990-1993. AUS Injection catalogs the most complete line of direct fit performance racing injectors. 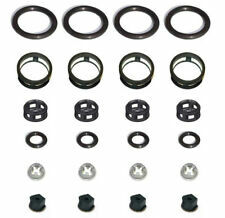 Our flow matched injector sets are application specific and engineered to outperform the competition. Nissan 240SX Altima 300ZX Q45 Fuel Injector Set 4 OEM. They may also fit other years and models. Description: 6pcs GENUINE 1996 Nissan 300ZX 3.0L Turbo V6 Fuel Injector Part #: 16600-21U01 / 16600 21U01 All Fitments: 1996 Nissan 300ZX 3.0L Turbocharged only Package Included: 6 x Fuel Injector Note: Please call your local dealer to verify the correct part number. And the compati1 x Position Sensorbility chart is for reference only, NOT 100% accurate. Buyer is responsible to make sure that this part fits your car first before purchasing. Please Note: *Please check the item and pictures for conformity before you purchase. *If this item doesn't work as you expected, please contact us and we will solve it for you! *Please don't leave us 1-3 stars feedback without communication! *Fast delivered from California. You will receive exactly showed on the picture. Each item has been researched and described to the best of our ability. 6 GENUINE 1996 Nissan 300ZX 3.0L Turbo V6 Flow Matched Fuel Injector 16600-21U01 * High Quality Remanufactured OEM Part * Free Fast Shipping form California Part #: 16600-21U01 1660021U01 1660021u00 All Fitments: 1996 Nissan 300ZX 3.0L Turbocharged only Every fuel injector tested by ASNU injector test bench before delivery! Packing list * 6pc Fuel Injectors. Off a 1986 Nissan 300zx 2 seater with manual transmission. We want you to be 100% happy with your order. Our photos are 100% real, unaltered pictures. The set of injectors you see in our photos are all different injectors. We don’t need to be deceptive! 1984-1985 NISSAN 300ZX. Not all remanufactured fuel injectors are created equal and there's a huge difference in their quality & performance. Fuel injector adapter kits fit 90-94 Nissan 300ZX 3.0L V6 VG30DE VG30DETT z32. - 1990-1994 Nissan 300ZX 3.0L Turbo. 1990-1993 Nissan 300ZX Naturally Aspirated. High Impedance Fuel InjectorsAdapter Kits. Design: Fuel Injector Connector Pigtail. This are the "Gen 2" revised Nissan design - Each wire is individually sealed, rather then having the combined insulation boot. There is also the weatherproof seal inside the connector itself. 1990-1994 Nissan 300ZX 3.0L. 1990-1993 Nissan 300ZX Naturally Aspirated. Flow matched to 1%-1.5% discrepancy. Flow Rate in CC per minute All of fuel injectors are tested by ASNU Machine! 1981-1983 Datsun 280ZX 2.8L L6. The price for set of 6 fuel injector! AUS 650cc HIGH FLOW Racing Fuel Injectors. 1990-1996 Nissan 300ZX.